I was struck by a news report three years ago of a mountain lion passing through our neighborhood. I simply couldn’t imagine seeing one of those sleek, majestic animals walk down our suburban street, past finely trimmed lawns punctuated by driveways and BMWs. But then a naturalist friend explained to me that the mountain lion was taking the same path that its forebears had taken for generations, starting long before humans settled in our area, along our creek bed. The San Francisquito (“little San Francisco” in Spanish) Creek is one of many creeks that take mountain runoff from the Pacific Coast range to the San Francisco Bay. Every year, from late spring to early fall, the water stops flowing so that the creek bed becomes a dry, rocky pathway. All year long, whether the creek is there or not, my two older sons (now 7 and 3-1/2), some friends of theirs, and I have come to make our creek bed into a nature hangout. I had heard of no more reports of mountain lion sightings in the past few years, and initially, we always stayed close to our route back up to the street. Left: the green line shows the man-made street path to my son Marco’s preschool. The winding creek to the left of the straight green line presents a more interesting route. The mountain lions’ ancestral pathway is a wonderful oasis from Bay Area sprawl, largely untouched by humans. 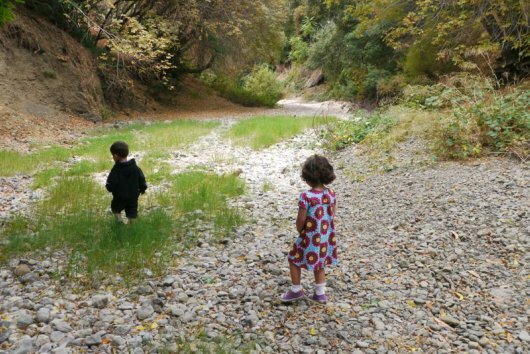 When the creek’s there, the kids and I wade up and down it, we build dams, and we skip rocks. In the dry months, we build forts and forage for all sorts of things, both natural (e.g. sticks) and man-made (e.g. golf balls from Stanford University’s golf course upstream). Last year, my oldest son, Marco, and I decided to try going from our home to his preschool along the dry creek bed, a 1 and 1/2 mile journey. This promised to be quite an adventure. No person we knew had ever walked along the creek bed for transportation — they would go down there via some footpath, spend some time there, and then come back up. I wasn’t sure if the entire route from our house to Marco’s school was passable. I had no idea how we were going to know when we had walked far enough, since the creek bed was sunken down below the level of the road many tens of feet, and I didn’t know if there would be a navigable path from there up to the road for us. I wondered what would happen if we encountered a mountain lion in a place where we knew of no way out of the creek bed. Finally, I had heard stories of homeless people, many of whom were mentally handicapped or on drugs, camping in the creek bed. So, the first day we set out on the creek bed for Marco’s school, we were well prepared. We arrived at the creek bed 2 and 1/2 hours before school started. My backpack was filled with hefty lunches, water, and juice. It was one wonderful, memorable hike. The weather was beautiful. We didn’t see any mountain lions or homeless people down there, but we did find dozens of golf balls and other interesting man-made artifacts. We improvised our way through a couple of difficult passages, and we spent a fair amount of time debating and testing different routes back up to the street. Still, the entire trip took us only an hour and 15 minutes, so we had lots of time for a long, leisurely lunch after we made it up to the street by Marco’s school. That first trip was so enjoyable and so surprisingly convenient that we took many other trips to school that way. After a few tries, we were able to do it in as little as 30 minutes, which was not much longer than the 10 or so minutes it took us by car. Best of all, though, it was a heck of a lot more fun. We reveled in the fact that we were traveling such a rich natural pathway that no other human, as far as we could tell, had discovered. This post is from Transit Secrets: The Unknown Paths from Point A to Point B – a current series on CoLab Radio. Post by Mike Lanza. Mike is the chief play officer of Playborhood.com, a blog that advises parents on how to give their children a life of neighborhood play.